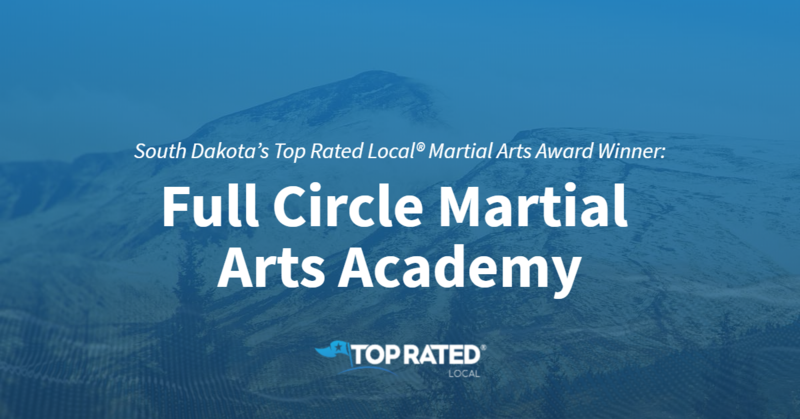 Top Rated Local® is pleased to announce that Full Circle Martial Arts Academy is a 2019 award winner for martial arts in South Dakota! Is your child interested in learning martial arts in Rapid City? If so, look no further than Full Circle Martial Arts Academy. Full Circle Martial Arts Academy has received dozens of reviews on three verified sites with an average rating of 4.92 stars, earning them a fantastic Rating Score™ of 95.24 and a 2019 Top Rated Local award for ranking among the top 10 martial arts centers in all of South Dakota! “My kids have been going to them for two years now, and I couldn’t have asked for a better teacher and team for my kids. Master Naomi is such a wonderful and understanding person.” – Sarina Y.
Naomi Even-Aberle, Master Instructor and owner of Full Circle Martial Arts Academy, generously gave us a few minutes of her time to tell us about her award-winning business and its phenomenal online reputation. Naomi attributes Full Circle Martial Arts Academy’s strong online reputation to their commitment to treating their customers like they are family, and said that people see the value in that. Congratulations to the team at Full Circle Martial Arts Academy for being a 2019 Top Rated Local award winner, and thank you so much, Naomi, for taking the time to speak with us! We highly recommend Full Circle Martial Arts Academy in Rapid City. Visit their website today! Top Rated Local® is pleased to announce that Gracie Jiu-Jitsu Goldsboro is a 2019 award winner for martial arts in North Carolina! 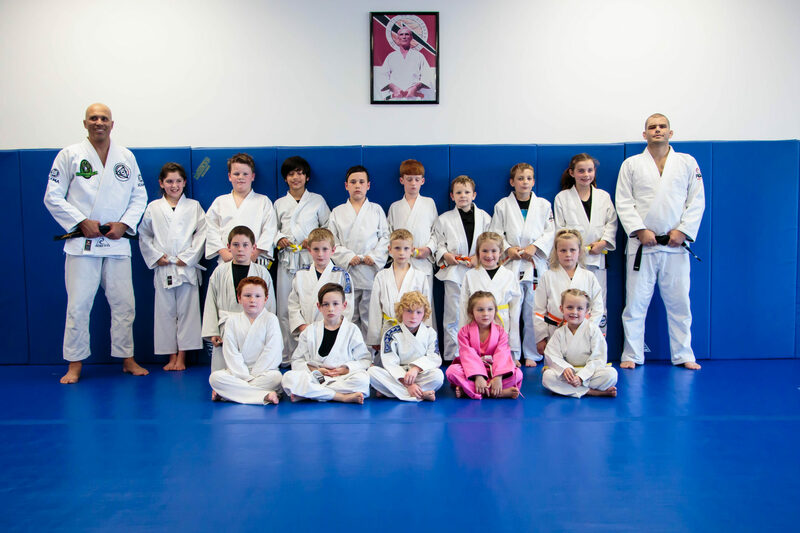 No matter your age or ability level, if you’re interested in learning effective self-defense while boosting your confidence, there’s no better martial arts center to turn to than Gracie Jiu-Jitsu Goldsboro. Gracie Jiu-Jitsu Goldsboro has received dozens of reviews on three verified sites with an average rating of 5.00 stars, earning them a phenomenal Rating Score™ of 96.00 and a 2019 Top Rated Local award for ranking among the top 10 martial arts centers in all of North Carolina! “This is a great place to train with an awesome instructor named Jake. Jake actually introduced me to Jiu-Jitsu, and 10 years later, I am eternally grateful to him. Jake manages to break any move down to its basic components and is very attentive at all times. 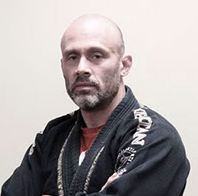 If you want to learn Jiu-Jitsu, Royce Gracie Goldsboro is a spot to not only learn Jiu-Jitsu but also to change your life for the better!” – Vassilis A.
Jake Whitfild, the owner of Gracie Jiu-Jitsu Goldsboro, generously gave us a few minutes of his time to tell us about his award-winning business and its spectacular online reputation. The first question we had for Jake was what sets Gracie Jiu-Jitsu Goldsboro apart from their competition in North Carolina. Jakes points to the fact that they offer classes for both adults and kids, and that his focus is always on getting the clients to where they need to be. We also wanted to know what their mission is at Gracie Jiu-Jitsu Goldsboro and how they work to make the world a better place. Jake told us that they are big believers that feeling safe is a human right and that their mission is to help people build the skills to make themselves feel safe in their ability to defend themselves. Jake attributes Gracie Jiu-Jitsu Goldsboro’s strong online reputation to their unwavering focus on delivering a quality product above all else. 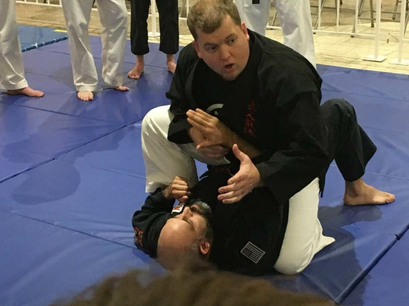 When we asked Jake how Gracie Jiu-Jitsu Goldsboro has gotten their name out there outside of their powerful online reputation, he told us that all of their success is organic and that they do no paid advertising. Their key to growth is word of mouth and an excellent downtown location, where they are visible to a lot of people. 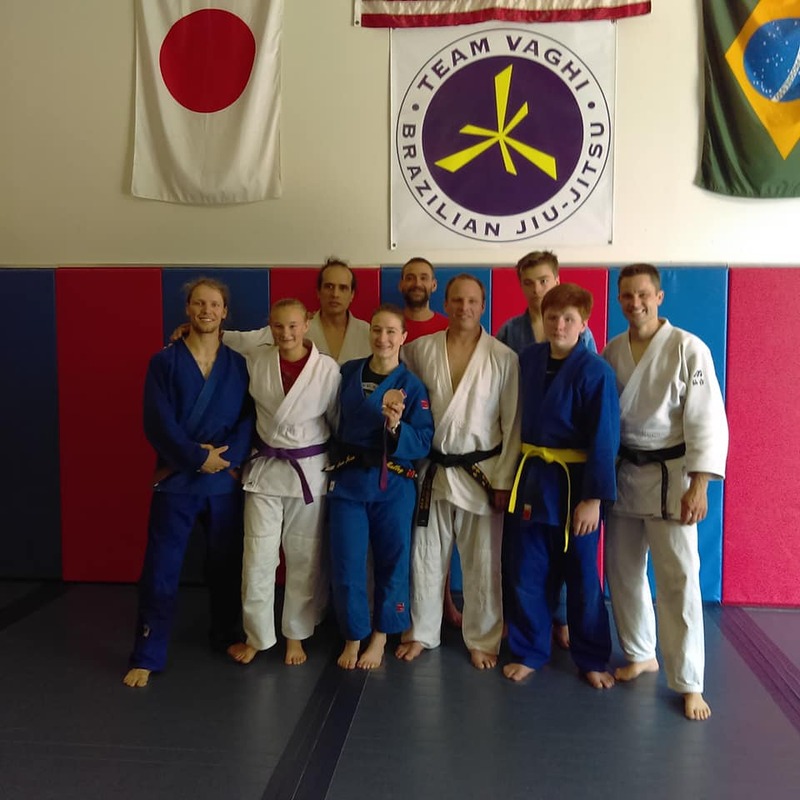 Congratulations to the team at Gracie Jiu-Jitsu Goldsboro for being a 2019 Top Rated Local award winner, and thank you so much, Jake, for taking the time to speak with us! We highly recommend Gracie Jiu-Jitsu Goldsboro. Visit their website today! Top Rated Local® is pleased to announce that Rogue Combat Club is a 2019 award winner for martial arts in North Carolina! Whether you’re interested in learning self-defense or you’re looking for a martial arts class for your child, Rogue Combat Club in Ashville is the place to go. Rogue Combat Club has received more than 100 reviews on three verified sites with an average rating of 5.00 stars, earning them a fantastic Rating Score™ of 96.00 and a 2019 Top Rated Local award for ranking among the top 10 martial arts centers in all of North Carolina! “I joined Rogue Combat Club after many failed attempts to get back in shape at other ‘conventional’ gyms. I feel like Rogue stands out among others because when you are a member, you are a MEMBER. You have great coaches and teammates there to motivate you to meet whatever goals you set, from just getting into shape and losing weight to getting into the cage. Also, a huge benefit I’ve found from training at Rogue is the stress relief you get from hitting the bag or grappling with a partner, and the progression of your self-defense skills is a big confidence boost. It’s an addictive feeling that makes you want to come back the next day, fix your diet and just all-around improve.” – Jesse E.
We wanted to learn a little more about this award-winning business and its outstanding online reputation, so we took a few minutes to talk with Johnny Buck, the owner of Rogue Combat Club. The first question we had for Johnny was what is it that sets Rogue Combat Club apart from their competition in North Carolina. Johnny said that they have a very high level of education and training when it comes to all different forms of martial arts, so they train hard and train very well, and that if you are willing to learn as a client, you will definitely benefit. Johnny went on to tell us that part of what they do and part of the reason they even do what they do is to change lives. He elaborated and said, “If you’re a part of Rogue, you’re a part of a family. Johnny attributes Rogue Combat Club’s strong online reputation to the experience of the trainers and to the community they’ve created. Rogue Combat Club has such a tight-knight community that, when one of the trainers’ Moped was stolen, gym members pulled together and raised the money to buy him a new one! Congratulations to the team at Rogue Combat Club for being a 2019 Top Rated Local award winner, and thank you so much, Johnny, for taking the time to speak with us! We highly recommend Rogue Combat Club in Ashville. Visit their website today! Top Rated Local® is pleased to announce that Alan Belcher MMA Club is a 2019 award winner for martial arts centers in Mississippi! From kickboxing to Brazilian Jiu-Jitsu, Alan Belcher MMA Club is the martial arts center to turn to in D’Iberville. Alan Belcher MMA Club has received hundreds of reviews on three verified sites with an average rating of 4.87 stars, earning them a stupendous Rating Score™ of 94.72 and a 2019 Top Rated Local award for ranking among the top 10 martial arts centers in all of Mississippi! “I joined the Ocean Springs location 10 months ago. I started coming to the women’s self-defense class in D’Iberville on Tuesdays and Thursdays. Recently, I started coming to the 9 a.m. kickboxing class there as well, as it allows me to knock it out (no pun intended) early and get on with my day. The support and encouragement from everyone, staff and fellow gym-goers alike, is amazing! !” – Valerie S.
In order to learn a little more about this award-winning business and its impressive online reputation, we took a few minutes to talk with Monica Medina, the manager of Alan Belcher MMA Club. Monica attributes Alan Belcher MMA Club’s strong online reputation to their online presence and told us that they do not ask for reviews. 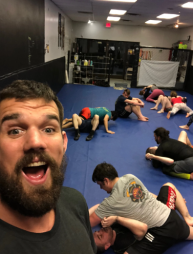 Outside of building a powerful online reputation, Alan Belcher MMA Club has gotten the word out about who they are and what they do by doing events in the community where they can get out and interact with people. Congratulations to the team at Alan Belcher MMA Club for being a 2019 Top Rated Local award winner, and thank you so much, Monica, for taking the time to speak with us! We highly recommend Alan Belcher MMA Club in D’Iberville. Visit their website today! 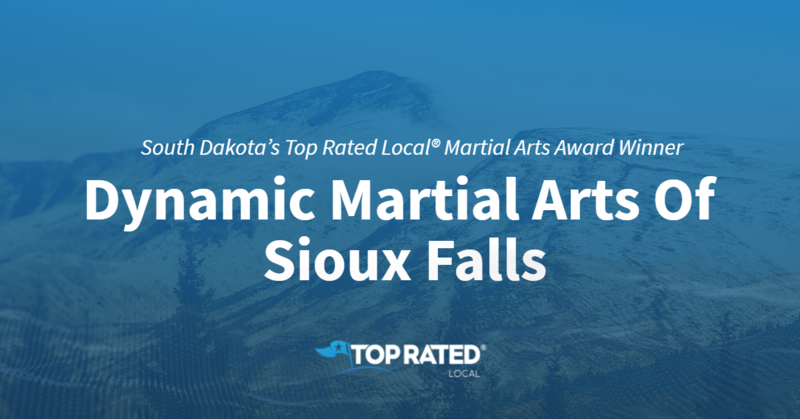 Top Rated Local® is pleased to announce that Dynamic Martial Arts Of Sioux Falls is an award winner for martial arts in 2019. If you are looking for a dedicated and traditional martial arts academy, look no further than this award-winning company! Dynamic Martial Arts Of Sioux Falls has received many overwhelmingly positive reviews across multiple verified sites with an average rating of 5.00 stars, earning them an impressive Rating Score™ of 89.30 and a 2019 Top Rated Local award for ranking as one of the top 10 martial arts studios in South Dakota! “DMA’s balance of expertise, challenge, and patience has made this older guy’s experience extremely positive, and the physical benefits have without a doubt followed me beyond the dojo.” -T.L. It is because of excellent reviews like this that Dynamic Martial Arts Of Sioux Falls is now able to call themselves a Top Rated Local award winner! We were excited to learn all about how Dynamic Martial Arts Of Sioux Falls has been able to build such an impressive reputation, so we sat down with the owner, Joe Herreman. The first thing we wanted to know was what it is that makes Dynamic Martial Arts Of Sioux Falls stand apart from their local competitors. Joe tells us that at Dynamic Marital Arts, they teach a practical application in a variety of martial arts. He says that their students get to do a little bit of everything, including striking, throws, and joint locks. We learned that the system they use was co-headed by the martial arts instructor for the LAPD. 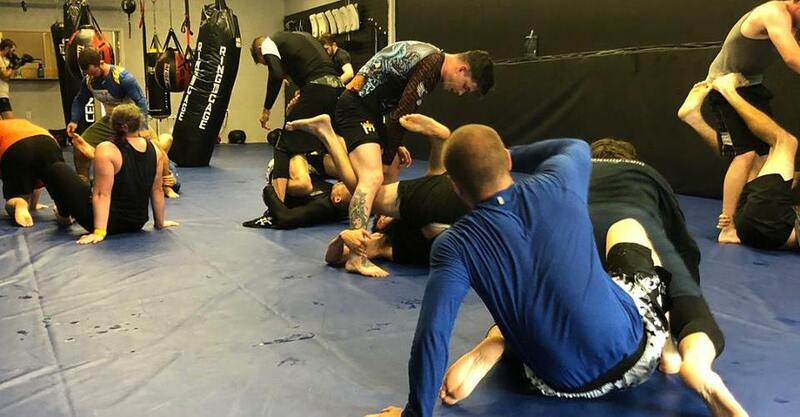 With as impressive a reputation as Dynamic Martial Arts Of Sioux Falls has, it is no wonder word of mouth has been their primary source for new clients. In fact, Joe tells us they really don’t invest in any other kind of marketing! Congratulations to Dynamic Martial Arts Of Sioux Falls for being a 2019 Top Rated Local award winner, and special thanks to Joe for taking the time to speak with us! 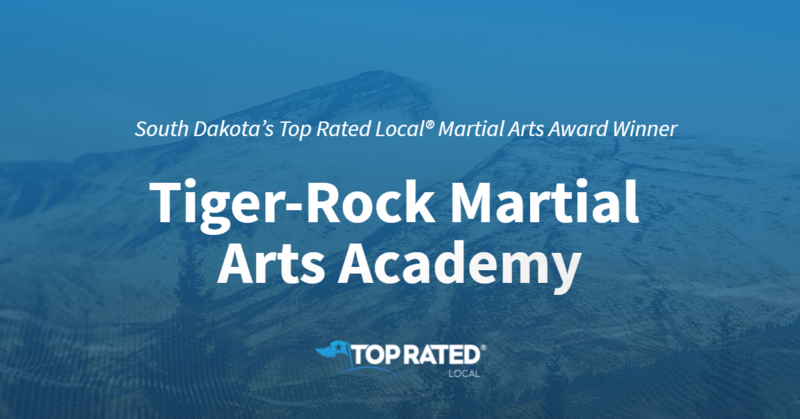 Top Rated Local® is pleased to announce that Tiger-Rock Martial Arts Academy is an award winner for martial arts in 2019. If you are looking for a martial arts academy that will help you or your kids to get a great workout and experience a life-long transformation, look no further than this award-winning company! 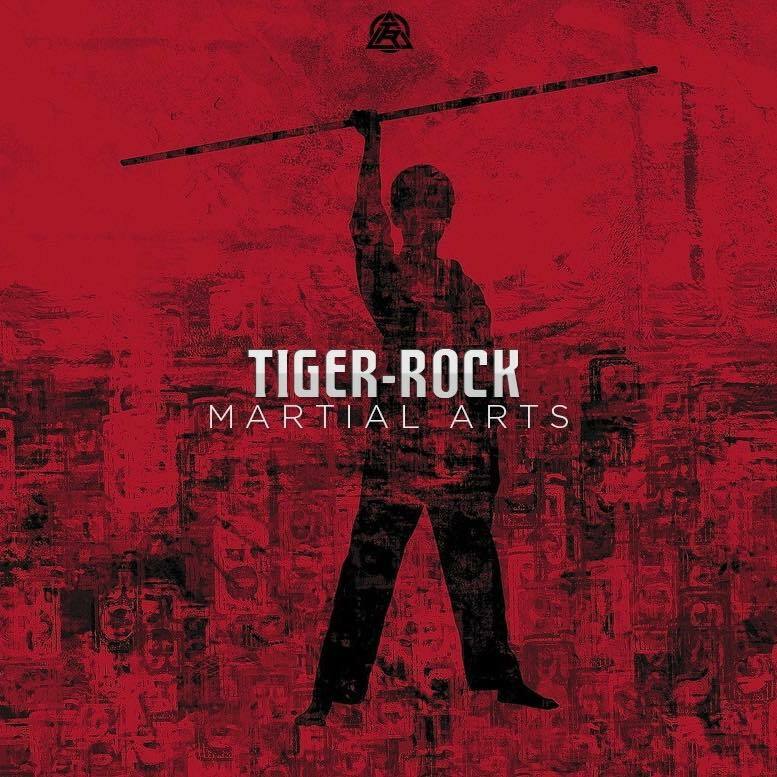 Tiger-Rock Martial Arts Academy has received many overwhelmingly positive reviews across multiple verified sites with an average rating of 4.79 stars, earning them an impressive Rating Score™ of 91.87 and a 2019 Top Rated Local award for ranking as one of the top 10 martial arts academies in South Dakota! It is because of excellent reviews like this that Tiger-Rock Martial Arts Academy is now able to call themselves a Top Rated Local award winner! We were excited to learn all about how Tiger-Rock Martial Arts Academy has been able to build such an impressive reputation, so we sat down with the owner, Shannon Donnell. Tiger-Rock Martial Arts Academy has certainly managed to build an impressive online reputation, so we were excited to learn about what kinds of marketing strategies they have used over the years. Shannon told us that they have utilized social media platforms to make posts to keep their community updated about all that is going on. They are excited about the number of organic reviews they have gotten thanks to social media. Congratulations to Tiger-Rock Martial Arts Academy for being a 2019 Top Rated Local award winner, and special thanks to Shannon for taking the time to speak with us! Top Rated Local® is pleased to announce that Sioux Falls Hapkido & Judo Club is a 2019 award winner for martial arts centers in South Dakota! Whether you’re interested in martial arts for yourself or your child to learn self-defense, build confidence or get in shape, there’s no better option than Sioux Falls Hapkido & Judo Club. Sioux Falls Hapkido & Judo Club has received dozens of reviews on multiple verified sites with an average rating of 5.00 stars, earning them a phenomenal Rating Score™ of 93.00 and a 2019 Top Rated Local award for ranking among the top 10 martial arts centers in South Dakota! “My son and daughter have been coming to this school for going on four years. There is nowhere else in town that can provide the level of expertise and commitment that the teachers at Sioux Falls Hapkido & Judo Club provide. They have taught my kids not only how to protect themselves and care for their bodies properly, but also how to be an all-around respectable, humble and honorable person. Your child or even you won’t be another number or client to them. Here, you will become family. [Erolling them at Sioux Falls Hapkido & Judo was] hands down, the best decision I ever made for my children.” – Holly H.
Ryan Schiebout, the owner and Lead Instructor at Sioux Falls Hapkido & Judo Club, generously gave us a few minutes of his time to tell us a little more about his award-winning business and its outstanding online reputation. Ryan and his team work hard to get the Sioux Falls Hapkido & Judo Club name out there by keeping their students up to date on everything going on real-time with the company. They also spread the word about who they are and what they do through community involvement, including participating in conventions, teaching free classes at The YMCA and working with the homeschool community. Congratulations to the team at Sioux Falls Hapkido & Judo Club for being a 2019 Top Rated Local award winner, and thank you so much, Ryan, for taking the time to speak with us! We highly recommend Sioux Falls Hapkido & Judo Club. Visit their website today! Top Rated Local® is pleased to announce that American Martial Art Academy is an award winner for Martial Arts in 2019. If you are looking for a martial arts academy for yourself or your children, look no further than this award-winning company! American Martial Art Academy has received hundreds of overwhelmingly positive reviews across four different verified sites with an average rating of 4.99 stars, earning them an impressive Rating Score™ of 97.88 and two 2019 Top Rated Local award for ranking as one of the top 50 businesses and the number one Martial Arts academy in Mississippi! 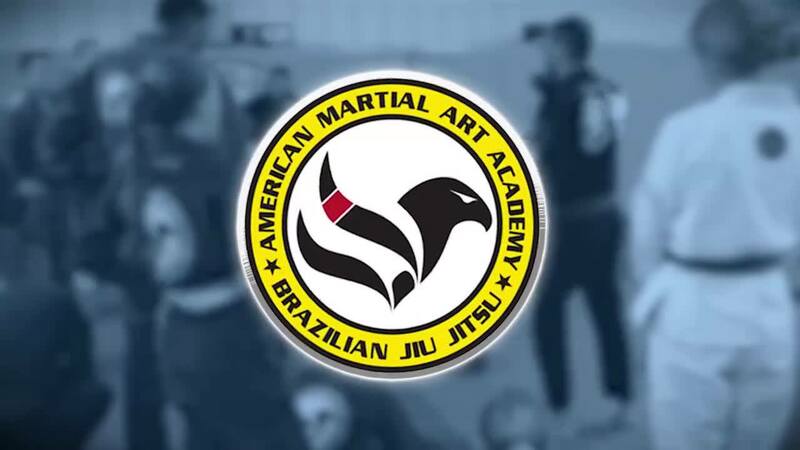 “The staff and facilities at American Martial Art Academy are first-rate. My kids started training at the gym when they were 10, and they are now almost 15 years old. They love training and competition, and have grown so much in the sport. It has taught them to be disciplined, set goals, and work hard to achieve those goals. The environment at the gym is like an extension of our family. There have been so many people, both staff and students, who have encouraged the boys and led by example on how to be outstanding citizens and team players. Absolutely [worth a] five-plus star rating!” – D.W. It is because of excellent reviews like this that American Martial Art Academy is now able to call themselves a Top Rated Local award winner! We were excited to learn all about how American Martial Art Academy has been able to build such an impressive reputation, so we sat down with the owner and instructor, Jim Fiore. American Martial Art Academy has certainly managed to build an impressive online reputation. We asked Jim how they have managed to market themselves. He told us that they love to share videos of the school. He said it is also important to always respond to their clients. Offline, American Martial Art Academy attempts to stay involved in the community as often as possible. With all of these strategies in use, their number one source for new clients has remained personal referrals. Congratulations to American Martial Art Academy for being a 2019 Top Rated Local award winner, and special thanks to Jim for taking the time to speak with us! 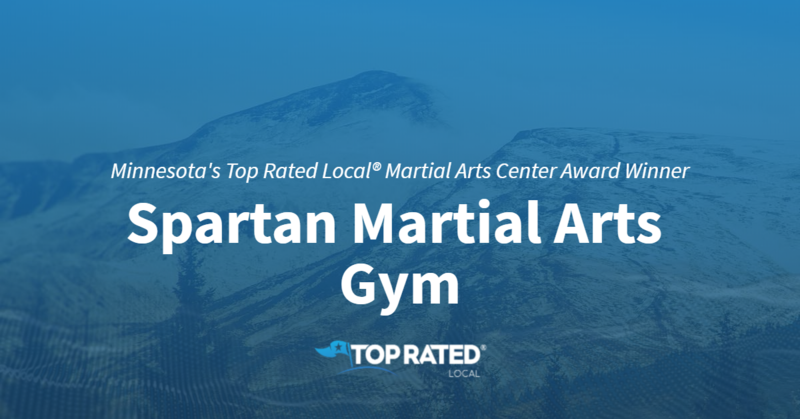 Top Rated Local® is pleased to announce that Spartan Martial Arts Gym is a 2019 award winner! “I have never done martial arts before but quickly fell in love after only a few classes. In any of the classes I’ve been to, there’s a mixture of students at all levels and the instructors are knowledgeable and patient, making sure that everyone gets individualized help based on their skill level. And everyone is so nice and helpful. I immediately felt like part of a family. I would, hands down, recommend this place to anyone- beginner to advanced trainees. Everyone has a place here.” -Renee S.
We got a chance to speak with Tom Schmitz, the owner of Spartan Martial Arts, about his business’ awesome online reputation and success. Congratulations to the team at Spartan Martial Arts for being a 2019 Top Rated Local award winner, and thank you so much, Tom, for taking the time to speak with us! Top Rated Local® is pleased to announce that Japan Karate Institute James Island is an award winner for martial arts in 2019. If you are looking for a martial arts institute that will help guide you or your child in a traditional martial arts form, look no further than this award-winning company! Japan Karate Institute James Island has received many overwhelmingly positive reviews across three different verified sites with an average rating of 5.00 stars, earning them an impressive Rating Score™ of 97.00 and a 2019 Top Rated Local award for ranking as one of the top 10 martial arts schools in South Carolina! “Japan Karate Institute James Island is an outstanding and family-oriented martial arts school [that teaches] traditional Wado-Ryu karate to people of all ages and abilities. Sensei Theraun Mixon is a valuable mentor to his students, and has cultivated a dojo where people enjoy training. From adults just looking to improve their physical fitness to kids learning focus, self-control, and a fun sport, I would recommend JKIJI to everyone! Come try a class and see what makes JKIJI special.” – J.F. It is because of excellent reviews like this that Japan Karate Institute James Island is now able to call themselves a Top Rated Local award winner! We were excited to learn all about how Japan Karate Institute James Island has been able to build such an impressive reputation, so we sat down with the owner, Theraun Mixon. Congratulations to Japan Karate Institute James Island for being a 2019 Top Rated Local award winner, and special thanks to Theraun for taking the time to speak with us!